Every so often in this trash world, we get to wake up to some good news that’s like a ray of sunlight on a gray and stormy day. Today’s breath of fresh air concerns the New Stratos, which apparently has finally been greenlit for production. Update: The New Stratos will still use Ferrari F430 underpinnings. Manifattura Automobili Torino, an Italian coachbuilder, announced today that it will create 25 limited production run of three re-imagined versions of the legendary rally car: a GT race car, a safari variant and a sports car meant for daily driving. All three will be powered by a 550-horsepower 4.3-liter V8 via a six-speed sequential gearbox. The cars will have full carbon-fiber bodies and dry weight will come to just 1,247 kg (under 2,800 pounds) with a 44/56 weight distribution. MAT claims that zero to 62 mph sprints will happen in just 3.3 seconds and top speed to be somewhere between 170 and 205 mph. The New Stratos will debut at the Geneva Motor Show in March, though April deliveries have already been scheduled, the company reports. Not many more details have been revealed at this time, so we expect to learn a lot more about it then. 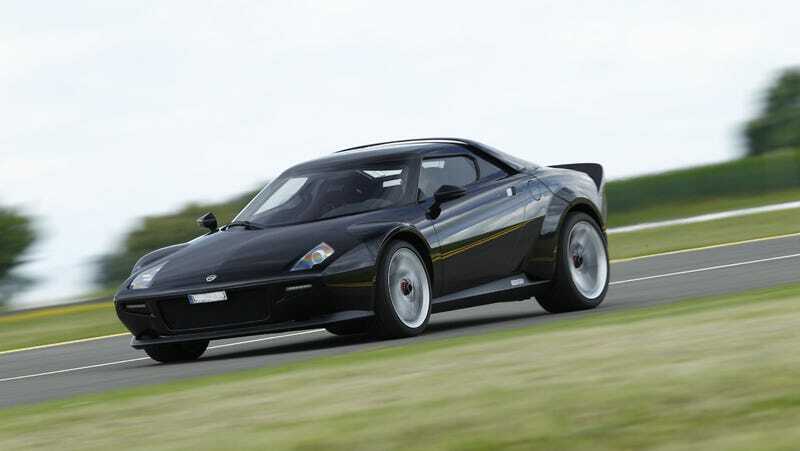 This New Stratos is the newest version of the, uh, original New Stratos concept from 2010. That car used underpinnings from a Ferrari F430 and there were supposed to be between 40 and 50 of them made, but Ferrari put a stop to it before things could get any further. That was in 2011. Manifattura Automobili Torino is the Italian company founded in 2014 by Paolo Garella, former Project Manager for New Stratos GbR of the whole “Tosta - New Stratos Project”. The Italian engineer, previously Head of Special Project at Pininfarina, and his company, will guarantee the respect and the quality of the original built. MAT, for the record, builds Glickenhaus’ SGC003s, the Apollo IE and the Devel Sixteen, writes Road & Track. It sounds like Garella started his own company after the Ferrari interference and just... kept on working towards his New Stratos plans. Was the Ferrari issue somehow resolved in the interim? We’ve reached out to MAT for clarification on both matters and will update if we hear back. The New Stratos will be based on an F430. The donor vehicles, all pre-registered, will be purchased from the market and then heavily modified and customized in accordance to the customer’s personal requirements. This limited run is the result of an agreement between our company and New Stratos Gbr and there will be no involvement from Ferrari and Pininfarina.